I still want to look good (not fat). I want to stay healthy. If this describes you, then this article is for you. 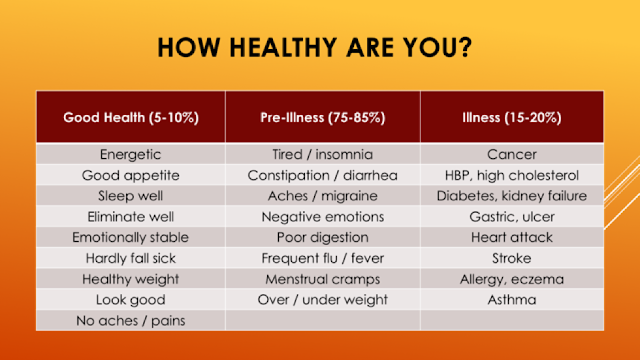 You will find out how to identify your level of health and how to take care of it. Q. Which category are you in? The majority of us fall in the Pre-Illness category. If we don't take care, it will be a matter of time before we fall into the Illness category. Q. Do you know why you fall sick? (ii) Acquired, which can be Acute i.e. sudden attacks from virus / bacteria, or Chronic, which happens over time from unhealthy lifestyle, bad dietary habits, stress, negative emotions etc. 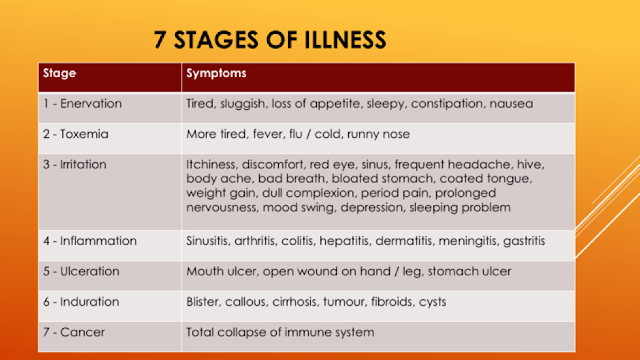 Another way to look at our level of health is by using the 7 Stages of Illness chart. These symptoms give you an indication of how healthy you are at this moment. To get to Stage 3, it usually takes a long time to degenerate from one stage to another. But after Stage 4, your disease will progress quite quickly. Cancer is the end result of toxin built-up. (i) Expel out the toxins. (ii) Allow your body to regain its self-healing ability. Do you want to find out what does our body need to stay healthy? I also have solutions on how to address the 3 causes of massive cells death. If you are new to my blog and want to find out more, please email me at askfuiping@gmail.com for a FREE consultation on your level of health and how you can improve it.